When the people of continents such as Africa, Asia or Latin America first came to Europe, we were brought over as slaves, and many of us were literally placed in human zoos, where the Europeans could see how exotic, savage animals looked and dressed. In our homelands, millions throughout the world died under the colonial expansion and exploitation of our wealth and resources. Left behind were the neo-colonial servants and slaves drivers, also known as our supposed governmental leaders, so that the capitalistic machinery could continue. Today, this reality is not much different. Our countries remained the same colonized and exploited countries as before; we are still looked down upon for who we are and we only gain respect when we are considered as folklore; we are still trampled upon, spat on and excluded, and we refugees are placed in Heims far from many possibilities of integration into the society like in Freienbessingen or Markersdorf in Thüringen and Eisenhüttenstadt in Brandenburg. The construction of modern day, brutal neoliberal deportation and persecution centers such as the Projekt X in Braunschweig and Bramsche, the Ausreisezentrum in Fürth or the innumerable deportation prisons throughout this country represents nothing more than the decadence of a neo-colonial power that has never been capable of making the empty slogans and promises of liberty, justice and democracy or even nie wieder! a reality. On the contrary, their abused and hollow meanings have long since unmasked the truth of the injustice behind their supposed help and goodwill: terror, hunger and injustice! With an ever increasing racist and repressive system, the restriction of our freedom of movement is lashed out from the whip of the slave driver with the „Residenzpflicht“ restrictions of movement against the refugees in Germany, racist police controls and police brutality. Even in our own countries the local police receive European financial aids to criminalize the peoples' desire for justice. If we manage to make it past the increasingly rigid and brutal controls of the European Fortress then we are immediately considered to be terrorists and criminals and our deportation is prepared even before they know who we are. No matter where we are, whenever we attempt to live a decent life, feed our families, enjoy education or even struggle for the right to life, we are criminalised, imprisoned and sent to our deaths (be it through hunger or repression) by the very societies which benefit most from our devastation and misery occasioned by their greed and economic intervention. The bureaucratic machine of oppression and injustice continues to work endlessly to keep us as a people without faces and rights. They simply want us to remain as objects to be stared at and talked about as they envisioned for us in the human zoos they constructed hundreds of years ago. When we are deported, we are sent back to the very lands that have been destroyed and raped of any future. And like when colonialism began, we are treated like animals not worthy of the so-called Europeans ideals of liberty, freedom and democracy. We are placed in Cages (Heims, Ausreisezentrum or deportation prisons) which they do not consider good enough for their dogs. They "wisely" expect us to accept this injustice without complaints and be grateful to them for their purported "magnanimity". They expect us to praise the U.S.A and European governments, WTO, IMF, World Bank, NATO,IOM and etc. for "trying to rescue us" from the poverty and ugly situation they imposed on us. Yet after so many centuries of colonialist and capitalist exploitation of our wealth and peoples, after so many massacres, repressive regimes and torture, we are still fighting both in our countries and here to overturn this injustice once and for all! We are still here, we are still strong and we still have our dignity! In Germany, France, Italy, Nigeria, Colombia, Palestine, Cameroon, Iraq, Peru, Iran, Irak, Togo, Sri-lanka and many other places, no matter where we are, our resistance - inherited from so many generations who fought and died for our liberation before us - continues and will not be defeated! We call on all refugees, migrants and progessive-minded peoples to come together in order to demonstrate that another world is possible and that solidarity, justice, brother- sisterhood and liberty are more than mere words and slogans without substance (unlike the words of the powerful that are nothing more than masked lies! ), that each finger by itself is weak and can be broken, but that when the fingers come together, they form a strong and resilient fist of resistance! Stop the deportations! 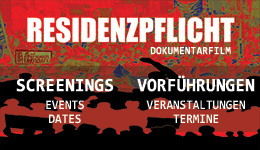 Abolish the“Residenzpflicht“ restriction of refugees to local districts in Germany! Wherever the repression is, we will be there! No injustice is secure from our resistance! Karawane for the rights of refugees and migrants in Germany.